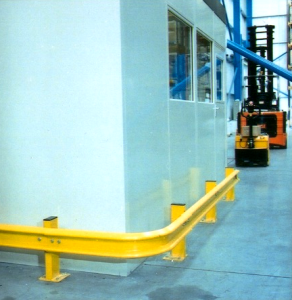 Designed to protect machinery, racking, shelving and partitioning from damage by forklift trucks, pallet trucks or trolleys etc. 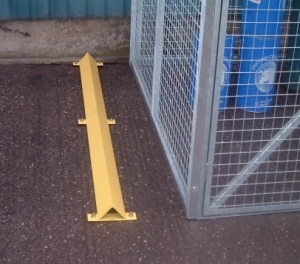 we are pleased to introduce our crash barrier options, in either a heavy or standard duty. 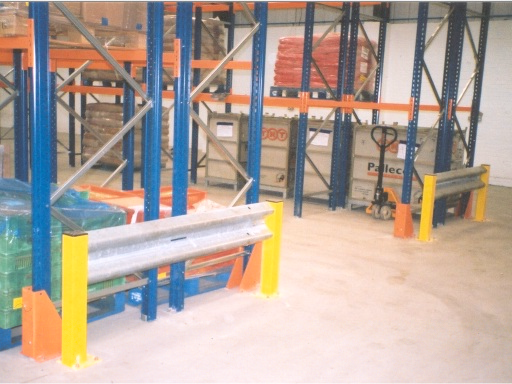 This is the ideal application for either a warehouse or stores area, with twin rail systems and different height support post options also available. Both duty versions can be supplied with quarter bend terminals, 90 degree bends and high visibility plastic end caps, with the heavy duty version can also be supplied with “fishtail” ends. For a simple and economic way of creating a safe pedestrian area within your factory or warehouse, a light duty barrier system is also available for edge protection of raised floors or at pedestrian protection at ground level. Available with single or double rails which are bolted to the posts so that individual components may be replaced if damaged. The images show the barrier powder coated in Yellow RAL1018, however, most colours are available to suit your corporate branding or colour scheme requirements. 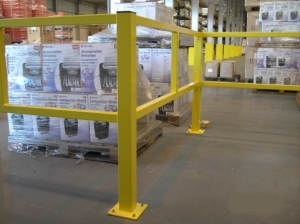 Height and length of rail are manufactured to suit a customer’s individual requirements; we recommend, however, a minimum height of 1,100mm and a maximum rail length between posts of 2,000 mm. 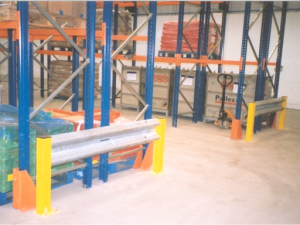 An inexpensive form of protection for racking, shelving and partitioning, consisting of angle 100 x 75 x 8mm and floor fixing lugs 180 x 50 x 6mm. 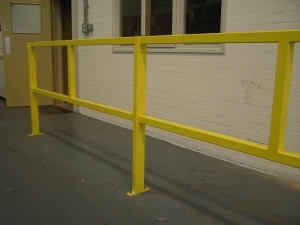 As with our protection barriers the images depicts the edge protection in Yellow RAL1018, however, these are also available in a colour choice to match your corporate branding and colour schemes.